The game mode that defined the original Star Wars: Battlefront games has just been added to the new versions of the game. The ‘new’ mode, Capital Supremacy, was first announced earlier this month, but finally made its way into the game last night. Capital Supremacy is a two-stage battle, beginning planet-side and tasking players with capturing neutral command posts and defending them from enemy troops attempting to do the same. Capturing posts will gain your team reinforcements, and once you reach the required number, you’ll have a short amount of time to make your way to transport ships and launch an assault on the enemy’s Capital Ship. The more players who make it to the transport on time, the more reinforcements you’ll have in the next phase of the fight. Once on the enemy ship, you’ll need to set timed charges across it. If you succeed, the ship will be destroyed, and you’ll win the battle. Fail, and you and your teammates will be returned to the planet surface to restart the process, capturing command posts and earning reinforcements. The game only ends once a Capital Ship is destroyed. The addition of a second phase is a marked difference, but the planetside part of the battle sounds like Battlefront 2’s closest comparison to the original Battlefront games. 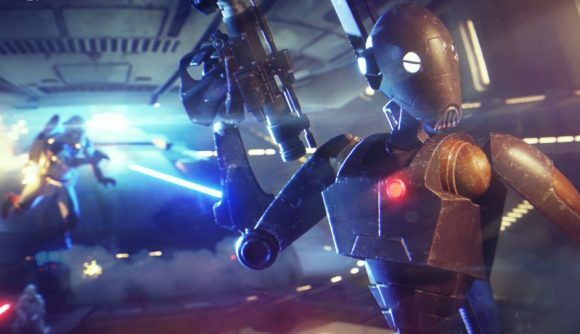 In an attempt to capture both those games and the overall scale of the Clone Wars – the period of Star Wars history that Capital Supremacy is set in – the devs are adding AI soldiers to the mode. 12 NPCs will be added to each side while you’re battling on the surface of Geonosis, turning it into a 32v32 battle. As in the original games, you’ll have access to heroes to help turn the tide of the battle. Obi-Wan and Yoda are among the Jedi’s representatives, while General Grievous and Count Dooku will feature as leaders the Separatist forces. I poured countless hours into the original Battlefront 2’s Conquest mode, although I’ll admit I took advantage of the fact my opponents were my little brother and an army of computers, rather than more FPS savvy foes. It’ll be interesting to see whether Capital Supremacy captures the charm of all those evenings spent blasting droids apart in locations all across the galaxy.